I was happy to hear that Andrea Jarosh, one of my favorite young pastry chefs was going to be bringing her skills to the 2011 New York Food and Wine Sweet event. Andrea is a native New Yorker so it was no surprise that she decided to showcase a dessert with a rich history that’s also become quite popular recently. If you think all cannoli have to be sugary sweet and heavy, you owe yourself a visit to Donatella restaurant to see what the real deal tastes like. 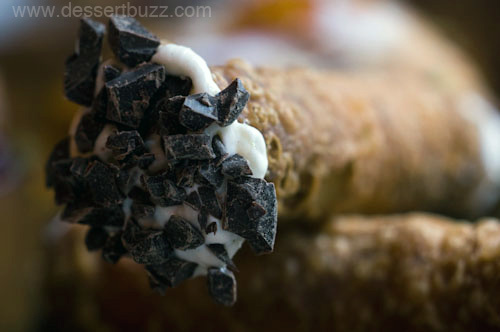 These cannoli are incredibly light and flavorful and have created a loyal following in Chelsea. Watch the video of Andrea at the New York Food and Wine Sweet after the jump. Donatella is located at 184 8th Ave (19 St) Their web site is here. More coverage of the Dessert Menu at Donatella NYC is here.